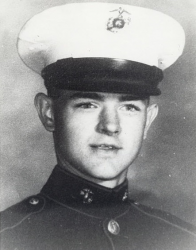 Corporal Larry Eugene Smedley (4 March 1949 - 21 December 1967) was a U.S. Marine who was posthumously awarded the U.S. military's highest award for valor, the Medal of Honor, for his actions during the Vietnam War. 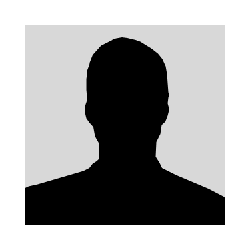 Larry Eugene Smedley was born on 4 March 1949 in Front Royal, VA. He attended elementary schools in Berryville, VA; Augusta, GA; Union Park, FL; and Howard Junior High School in Union Park, leaving the latter in 1964. He enlisted in the U.S. Marine Corps on 18 March 1966, at Orlando, FL, then reported to the Marine Corps Recruit Depot Parris Island, SC, and underwent recruit training with the 1st Recruit Training Battalion. In July 1966, he completed individual combat training with the 2nd Infantry Training Battalion, 1st Infantry Training Regiment, Marine Corps Base Camp Lejeune, NC. Upon completion of recruit training, Pvt Smedley served as a rifleman and fire team leader with Companies D and C, respectively, 1st Battalion, 8th Marines, 2nd Marine Division, Camp Lejeune. He was promoted to Private First Class on 1 September 1966 and to Lance Corporal on 1 January 1967. In July 1967, LCpl Smedley arrived in the Republic of Vietnam. He was assigned duty as a rifleman and squad radio man with Company D, 1st Battalion, 7th Marines, 1st Marine Division, and was promoted to Corporal on 1 September 1967. On 21 December 1967 while on patrol in Quang Nam Province, he was mortally wounded in the action for which he earned the Medal of Honor, posthumously. 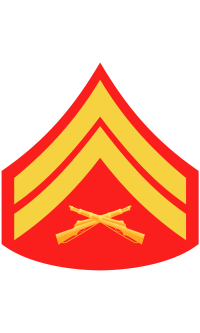 Rank and organization: Corporal, U.S. Marine Corps, Company D, 1st Battalion, 7th Marines, 1st Marine Division. Place and date: Quang Nam Province, Republic of Vietnam, 21 December 1967. Entered service at: Orlando, FL. Born: 4 March 1949, Front Royal, VA.
Citation: For conspicuous gallantry and intrepidity at the risk of his life above and beyond the call of duty while serving as a squad leader with company D, in connection with operations against the enemy. On the evenings of 20-21 December 1967, Cpl. Smedley led his 6-man squad to an ambush site at the mouth of Happy Valley, near Phouc Ninh (2) in Quang Nam Province. Later that night an estimated 100 Viet Cong and North Vietnamese Army regulars, carrying 122mm rocket launchers and mortars, were observed moving toward Hill 41. Realizing this was a significant enemy move to launch an attack on the vital Da Nang complex, Cpl. Smedley immediately took sound and courageous action to stop the enemy threat. After he radioed for a reaction force, he skillfully maneuvered his men to a more advantageous position and led an attack on the numerically superior enemy force. A heavy volume of fire from an enemy machinegun positioned on the left flank of the squad inflicted several casualties on Cpl. Smedley's unit. Simultaneously, an enemy rifle grenade exploded nearby, wounding him in the right foot and knocking him to the ground. Cpl. Smedley disregarded this serious injury and valiantly struggled to his feet, shouting words of encouragement to his men. He fearlessly led a charge against the enemy machinegun emplacement, firing his rifle and throwing grenades, until he was again struck by enemy fire and knocked to the ground. Gravely wounded and weak from loss of blood, he rose and commenced a 1-man assault against the enemy position. Although his aggressive and singlehanded attack resulted in the destruction of the machinegun, he was struck in the chest by enemy fire and fell mortally wounded. Cpl. Smedley's inspiring and courageous actions, bold initiative, and selfless devotion to duty in the face of certain death were in keeping with the highest traditions of the Marine Corps and the U.S. Naval Service. He gallantly gave his life for his country. The name Larry Eugene Smedley is inscribed on Panel 32E - Line 40. • Marine Corps League. The Marine Corps League Detachment #64 is named in honor of Cpl Larry E. Smedley. • Corporal Larry E. Smedley Combined Maintenance Facility. In 2003, with the dedication of a new tri-service Armed Forces Reserve Center facility for the Army Reserve, Navy Reserve and Marine Corps Reserve in Orlando, FL, the Combined Maintenance Facility for the complex supporting Army Reserve and Marine Reserve vehicles was named in Corporal Smedley's honor. • Corporal Larry E Smedley's Memorial Plaque. Corporal Smedley's full Presidential Citation is etched into a special plaque in front of the Orange County, FL, courthouse. It is part of a monument in memory of those Orange County Florida residents, Corporal Smedley among them, who gave their lives for their country in World War I, World War II, The Korean War, The Vietnam War, and the Iraq War. • Corporal Larry E Smedley Memorial Bridge. Located on Route 340 between Page and Warren County, VA.
Corporal Larry Eugene Smedley was killed in action on 21 December 1967. He was buried with full military honors at Arlington National Cemetery in Arlington, VA, in Section 31, Lot 6486.